Humans are not the only animals that are able to organize themselves into coordinated groups or societies. Some animals exhibit incredible feats of coordination, but unlike us, they do so without a leader or a global view of the outcome, like a set of blue-prints. We may all be familiar with the hypnotic movement of a school of fish or a flock of starlings, which coordinate their movements so expertly in order to evade predation. By remaining visually connected with a crowd, a predator is less likely to narrow-in and pick you off as a stream of other options flow by. But how do they do it? You may be asking. We are still trying to figure that out exactly, but in basic terms, each bird is following a set of simple rules that guide it to stay within a certain distance from its visible neighbors, all while moving, accelerating or turning. Another example of spectacular coordination is in select species of fireflies, which synchronize their flashing when in dense aggregations. Imagine a warm night along a River in Thailand. You gaze up at the dense foliage lining the shore and for an instant you see a tree erupt into green light, as if it were covered in hundreds of green Christmas lights. A flash – again! 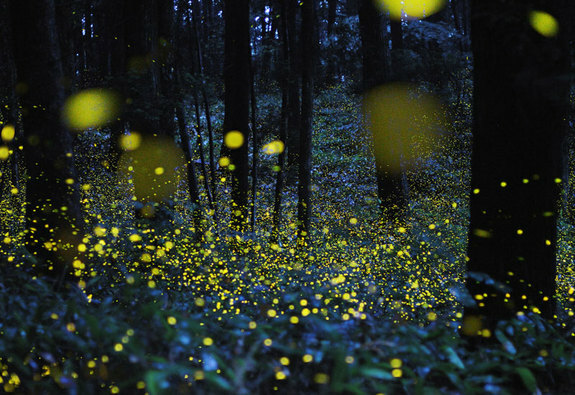 The tree lights-up repeatedly and rhythmically as each firefly releases a flash of light at the same instant. Why perform such a display? Well, they didn’t mean to – it’s an accident. Each firefly is actually a male trying to attract a female, who advertises his sexiness by flashing. But, it’s not quite enough to be bright – he needs to be first. The first to flash, that is. The other males around him may be quite attractive, but he really stands out by flashing before all of his competitors. With everyone trying to be first, everyone eventually ends up flashing at nearly the same moment until they are all synchronized. The result is a light display that seems well planned and coordinated. But despite the hypnotic quality of these creatures, their accomplishments seem quite mundane compared to the degree of coordination achieved by the social insects, like termites, ants, social bees and wasps. These animal groups are not just coordinating their movements or synchronizing their behavior; their behavior is organized to get something done for the group, to accomplish a specific task. Whether they are building structures, protecting the group from predators, or making decisions as a group, colony organization emerges even though each individual is naïve as to how their actions contribute to the whole. For instance, the building behaviors of weaver ants South East Asia and Australia go beyond simple synchrony. These canopy dwelling ants build their nest chambers out of leaves by pulling neighboring leaves together using the combined strength of several ants. Once the leaves are in place, a different set of individuals apply a silky adhesive that sews the leaves together, forming a cozy cavity the ants call home. 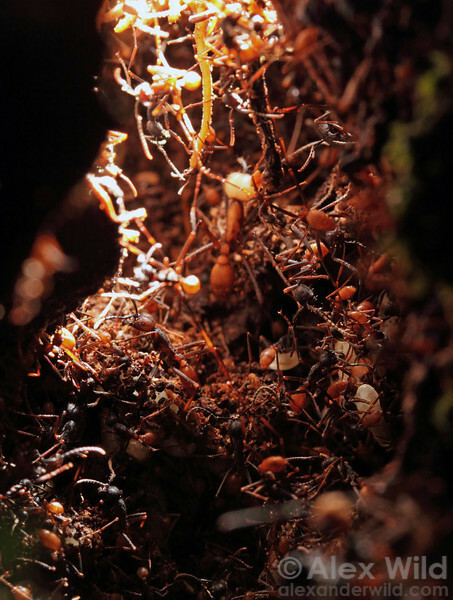 Army ants are also builders, but they create temporary nest cavities out of their own bodies. Individual workers grab onto one another using special hooks at the ends of their feet to form a large, but highly structured ball-o’-ants which contains both brood cavities and a safe, thermally regulated space for their queen. When their nest is disturbed, Synoeca wasps in the Neotropics will ‘roar’ at a potential predator by beating their wings against the wall of their nest cavity to create reverberations. The colony synchronizes their wing beats to produce a sound reminiscent of an approaching marching army. Synoeca wasps always perform this specialized threat display before attacking. Their display is an honest signal of their extremely painful sting (a 4 on the Schmidt Pain Index! ), but is also a useful way of avoiding a costly attack, which ends up in many deaths for the colony, as each sting is fatal to the wasp. When honeybee colonies need to move to a new nest site (i.e. are in the market for real-estate), the colony as a whole must come to an agreement about where to move. A colony has thousands of individuals, yet remarkably, the colony comes to a consensus by voting for the best options, much like our democratic human societies. Bees that have located good options will tell other bees to go have a look for themselves, but they ‘tell’ other bees by performing a waggle dance that indicates the location of the site. The better the site, the more that bee will ‘tell’ others, and thus more bees will visit that site. Bees vote by simply being present at the potential site, and once a threshold number of visitors are present, the colony takes flight and move-in to their new home. In contrast to the flocks of birds or the fireflies, the level of sophistication and coordination that social insects achieve is possible because natural selection is operating differently. Many social insects are what we call “superorganisms”, and they function more like a unitary organism rather than groups of self-interested competitors. Hölldobler B., Wilson E.O. 1990. The Ants. Harvard University Press, Cambridge, Massachusetts. Rau, P. 1933. Jungle Bees and Wasps of Barro Colorado Island. Kirkwood, Missouri. Seeley, T. D. 2010. Honeybee Democracy. Princeton, New Jersey: Princeton University Press. Strogatz, S. 2003. Sync: The Emerging Science of Spontaneous Order. Hyperion, New York, New York. Next Post Fun Fact Friday: Butterflies Taste with their Feet! So, you want to go to grad school? Hidden Colors: You can't see them, but lizards can!